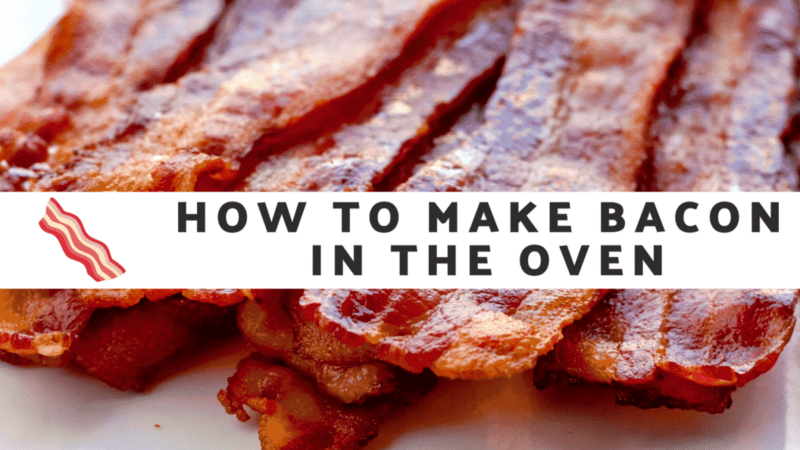 I wanted to share this easy recipe showing you how to make bacon in the oven. This is actually my preferred way of cooking bacon. Whenever I try to make bacon in a pan, my entire kitchen turns in to a grease trap and my clothes get ruined. I don’t like to mess around with my fashion, people!!! Cooking bacon in the oven is a cleaner way to make it – trust me!! Less mess and all the taste. You can get those pieces as crispy as you want them, too. There are no limits! I am not ruining any of the fun. It will be the same glorious experience that you are used to – maybe even better?? Who knows! A lot of my friends use a bacon rack which I currently don’t own but am looking into. Apparently, it takes away all the excess grease and releases it from the bacon pieces right onto the pan. BLISS! I think I am going to get one. In the video below, I don’t use one though. So, don’t worry if you don’t have one yet either. You can be old school and not fancy like me. LOL! Bake for 10-20 minutes depending on how crispy you want it. You do not need any oil or salt. You literally don’t need to do anything!!! You also don’t need to turn the bacon. Leave it alone. When you are happy with “crispy factor”, remove from heat and take pieces of bacon and place on a plate lined with paper towels. This will remove excess grease. Pat dry with more paper towels. Do you cook your bacon in the oven? Do you microwave it? Or are you someone who really likes to use a pan? I would love to know!